Are you loading up the car and heading on the Stena to France? Or are you taking a trip down to Wexford? Family camping is great fun, but can take a bit of planning to make sure it all goes smoothly and everyone is happy. We’ve gathered some advice based on our staff’s years of camping experience. 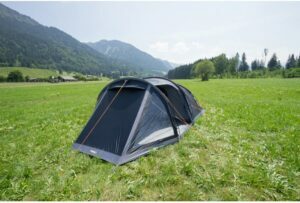 John, one of our camping experts recommended getting a few smaller tents rather than one large tent for the family. 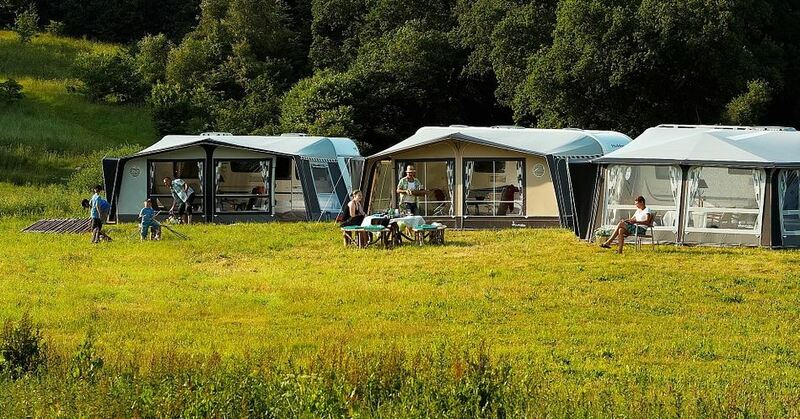 “You can turn your camp site into a camping village.” It gives Mam and Dad some space, and the kids will love having their own tents. “A Tay 200 or a Spey 200 for the kids and something like a Beta 350 for the parents is a great set up. Sometimes it even works out costing less than buying the 6 man tent for the family.”. On top of all that, when the kids are a bit older and go camping alone they’ll have their smaller tents to take with them. Another one of our experts, Aoife, recommended getting a big stove, like the Camping Chef. “It’s got two rings, and a grill underneath, which means you can get your sausages and tea going up top, at the same time as you’re cooking the rashers!” With a big stove you can still stay nice and portable, but you aren’t relying on the campfire for every meal you cook. Who doesn’t love a big breakfast in the woods? Packing a good stove means no one in the family has to go hungry. Looking for more camping tips? Here’s a short and sweet list of some of our favourites. Turn cooking into a family activity. Prep veggies and and let everyone make their own foil pocket filled with whatever they fancy. Seal them up and throw them on the BBQ. Teach them good habits- remind them to Leave No Trace – dispose of rubbish and fires responsibly, not to pick flowers. No one likes itchy insect bites while camping. Keep the bugs away with sprays, smidge, mosquito bands, nosilife treated clothing, sage, rosemary and citronella. This one is for camping in Ireland especially. Don’t let the rain stop you. Bring raincoats and wellies and be prepared to get outside. But at the same time, do have a rainy day plan. Know where the nearest indoor pool or museum is just in case the rain does get too heavy and you feel cabin fever setting in. Going camping doesn’t mean skipping your daily routine. 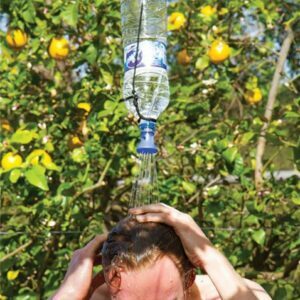 Set up a shower station with a bottle and shower head attachment. It’s a great way to cool the kids down. 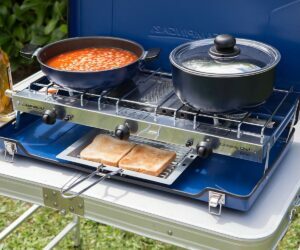 Campingaz Camping Chef: The perfect family breakfast stove. Seek shade. Wind Shelters are great for staying outdoors but staying protected from the elements. Or get crafty and create your own shade with a tarp and some paracord. Make night time trips to the toilet less spooky by giving them a glow stick to wear around their neck. It also means you’re less likely to lose the kids in the dark. Obviously Great Outdoors has all the family camping equipment you could ever want, but don’t be afraid to DIY stuff. You can make a lantern out of a head torch and bottle of water. Or, you can turn the party up with the colourful Moji Lantern. And of course, you are always welcome to come in to Great Outdoors on Chatham Street and ask our team for more tips and advice on family camping and if you’re unsure about how big a tent is, just ask and we will pitch it for you in-store.